and the resultant impacts of the event. More about flag symbols on car licenses. At the time of the church massacre in Charleston, SC, nine states sold Sons of Confederate Veterans specialty car license plates. The plates display a symbol of the group. 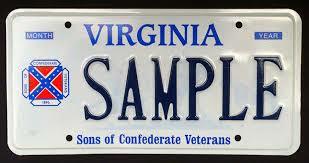 It includes a small red and blue confederate flag on the left side of the plate similar to the following. Eight of the nine states -- Alabama, Georgia, Louisiana, Mississippi, North Carolina, South Carolina, Tennessee and Virginia were former members of the Confederate States of America. The remaining state, Maryland, stayed in the Union. Judge Marvin J. Garbis of the U.S. District Court of Maryland Â lifted an 18 year old court injunction. 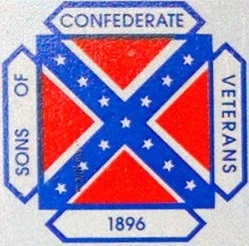 It had required the state to continue distributing Sons of Confederate Veterans' license plates on the grounds of the U.S. Constitution's First Amendment, which guarantees freedom of speech. However, in view of the U.S. Supreme Court's decision in June that ruled the contents of license plates to be government speech, Judge Garbis determined that the Government of Maryland is now free to control the language that appears on its licenses. The plates will be phased out starting on 2015-NOV-17. During the week of NOV-20, Dylann Roof, 22 was judged to be competent to stand trial in federal court for the murder of nine people in a Bible study class at the Emanuel African Methodist Episcopal Church in Charleston, SC during 2015-JUN. 5 He has been charged with 33 federal charges, including one hate crime account. He has also been charged in a state court with nine counts of murder. "... through his personal associations or experiences with white supremacist groups or individuals or others." More developments are expected in the future.